1961 was the year we sold our very first bouncer. 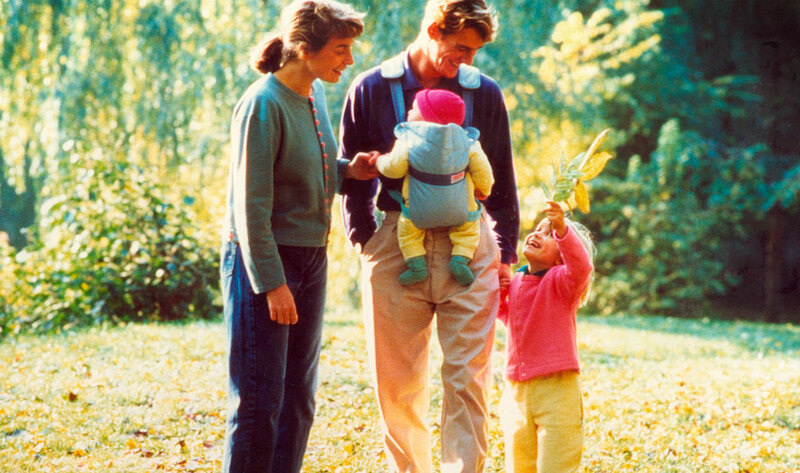 Björn Jakobson understood how it would make life easier for families with young children and he was right – it’s been one of our best-loved products ever since. BabyBjörn was born! Björn and Lillemor, a textile designer and art director, got married and had four children, each one of whom was the inspiration behind a new product to solve an everyday dilemma. Our product range soon expanded to include a travel cot, a high chair and a changing table. Björn always worked closely with paediatricians and in the 1970s they encouraged him to develop a baby carrier. New findings shed light on how important plenty of closeness is for a tiny baby. 1973 was the year Hjärtenära (“Close to heart”) gave parents in Europe the means to carry their babies safely on their chest. During the 1980s, there was more and more talk about the important role dads play in the lives of their tiny babies. So dads were featured in BabyBjörn’s ads for the first time – something that wasn’t entirely uncontroversial. But dads were here to stay and the importance of the closeness of both parents to their baby has always been one of BabyBjörn’s key concepts. Björn and Lillemor are passionate about improving the products. After years of developing, filming, testing and interviewing, we were able to present Baby Carrier Original, which is now used all over the world. Lillemor, who wants to create unisex designs suitable for both parents, launched a black baby carrier, a revolutionary concept in the baby product industry. My inspiration comes from children and making life easier for families with young children. It’s also amazing to see how we’ve helped to change attitudes to the role dads play. Many products have been developed since then – our cradle, high chair, travel cot and several other baby carrier designs. Parents can now choose between different baby carrier designs in different fabrics, depending on how they want to carry. 2013 was the year we introduced One and We – baby carriers you can use to carry your child on your back when they are over 12 months. About 40 million babies and counting have been carried close to their parents in a BabyBjörn baby carrier.